Confederacy, 1861, 5¢ green, tied by "Richmond, Va., Mar 11, 1862" cds on reverse of allover "Intemperance is the Curse of the World" propaganda design on cover to Knob Creek, N.C.; stamp applied across backflap and torn upon opening, subsequently rejoined and portion of back cut for display, Very Fine appearance; with 2018 P.F. certificate. Scott No. 1 Estimate $2,500 - 3,500. 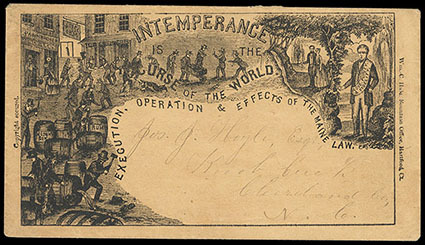 A VERY RARE CONFEDERATE USAGE OF THIS SCARCE INTEMPERANCE DESIGN. 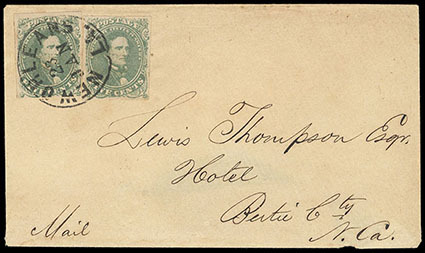 Confederacy, 1861, 5¢ green, two lovely singles tied by "New Orleans, LA, 23 Jan" cds on cover sent to Lewis Thompson, Hotel, Bertie County, NC, part of flap torn off, Very Fine and attractive. Lewis Thompson, a successful businessman, owned plantations near Woodville (also called Hotel), Bertie County, North Carolina and in Rapides Parish, Louisiana. Lewis was also a political leader in North Carolina, serving in the House of Commons and the State Senate, 1831-1852, and as a member of the General Convention of 1865. 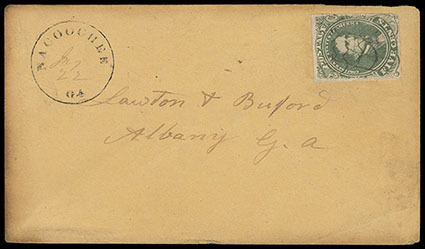 Confederacy, 1861, 5¢ green, four margin single, manuscript cancelled on cover tied by unusual "Nacoochee, Ga." cds with manuscript "July 22" date, sent to Albany, Ga., flap torn with small part torn off, Very Fine. 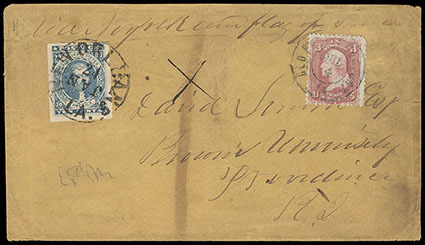 This cover was obviously sent without a "Due 5" via the "Universal 10 cent rate" of 1 JUL 1862. Reference Confederate Philatelist article published July - August 2000. Nacoochee is the Anglicization of the Cherokee pronunciation of the Muscogee word, Nokose, which means "bear". Confederacy, 1861, 10¢ blue, large to huge margins, tied by "New Orleans La., Jan 24" cds ("Jan" inverted) on buff cover to Providence R.I. endorsed "Via Norfolk and Flag of Truce" at top, pencil "Exd M" examiner's marking at bottom left and manuscript "X" at center, entered U.S. mails apparently prepaid with U.S. postage tied by Old Point Comfort Va. cds, replacement 3¢ rose (65) added for appearances; tone band and portion of backflap missing, Fine and rare use. 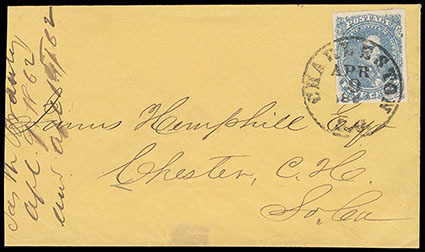 Confederacy, 1861, 10¢ blue, ample to mostly large margins, tied by double circle postmark of "Mobile, Ala, Feb 18" on adversity cover fashioned from a business document and sent to Thorn Hill, Alabama via Tuscaloosa, couple of unnoticeable cover tears, Very Fine. 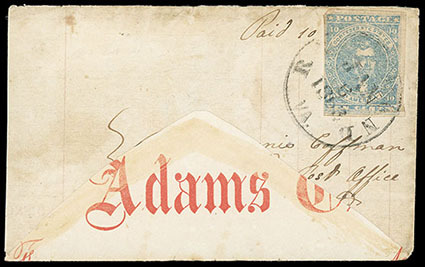 Confederacy, 1861, 10¢ light milky blue, tied by "Richmond, Va., Jan 6, 1863" cds on adversity cover made from Adams Express co. printed package receipt, addressed to Mount Clinton, Va.; light soiling and small portion of stamp added at bottom right, Very Fine appearance. 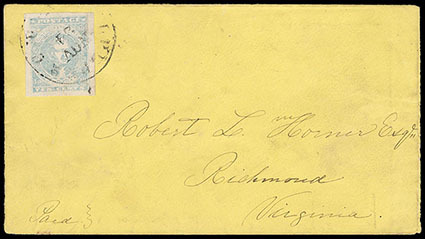 Confederacy, 1861, 10¢ light milky blue, Stone Y, large margins and bright color, tied by "Culpepper C.H., Va., Nov 24" cds on cover to Richmond, Va., Very Fine and choice. Scott No. 2e Estimate $250 - 350. 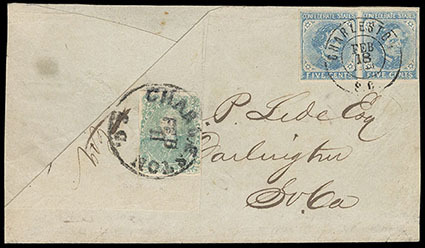 Confederacy, 1862, 2¢ green, large margins to in at top right, tied by "Charleston S.C. Feb. 11" circular datestamp and used inside a turned cover to Charleston (proper 2¢ drop rate use), stamp appears to be cut in half, outside used with horizontal pair of 1862 5¢ Blue, Local (7), tied by "Charleston S.C. Feb. 18, 1863" double-circle datestamp and sent to Darlington S.C., opened for display, datestamp on 2¢ partly drawn in, lovely Very Fine appearance, a scarce use of the 2¢ stamp on a turned cover, ex-Kohn, Brandon. Confederacy, 1862, 5¢ blue, scarred design plate flaw, tied by "Charleston, S.C., Apr. 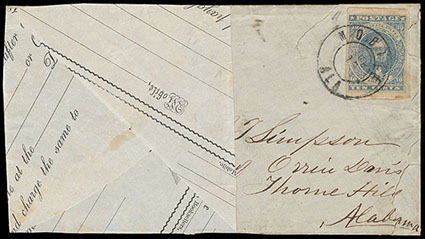 9, 1862" on cover sent to Chester, C.H., SC., cover slightly reduced at left, Extremely Fine. 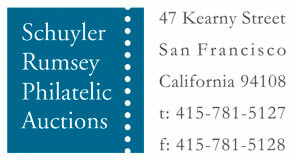 The stamp has a diagonal white line from the "P" of Postage through the bottom of the design. On page 106 from the book, The Postal Service of The Confederate States of America and page 128 from the book, The New Dietz Confederate States Catalog and Handbook, this example is illustrated. it is described on Page 107 of The Postal Service of The Confederate States of America as follows, "THE SCARRED DESIGN---From time to time pieces will turn up which show a jagged, colorless line across the design….Some students have erroneously attributed this mark to a "Cracked Stone. "…This scar is the result of some sharp substance…possibly grit…locating on the sponge used in dampening the stone, and scratching the design when the sponge passed over.". Confederacy, 1862, 5¢ blue, tied by "Charleston, SC, Apr. 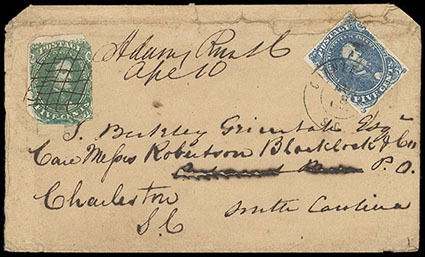 8, 1862" cds on cover sent to Adam's Run, S.C., the cover was then forwarded with a CSA 1861 5¢green (#1, clipped corners) with manuscript postmarked "Adams Run, SC, Apr 10" with cross-hatch cancel and sent back to Charleston, SC., some cover wear, Fine, an nice usage of the Green & the Blue Jeff Davis adhesives.